ASKfm has partnered up with The Diana Award to put out the searchlight and find the new ASKfm Hero – a champion of positivity for online community of over 160 million users. In March 2017 the “ASKfm Hero” competition was launched. People from across the world submitted a one-minute long video, where they talk about what heroism means to them and how they are making the world a better place. 16 entrants, whose videos received the largest number of votes, became finalists, and the final winner and runner-up were selected by a panel of judges. Winner Reza Pahlevi is an inspiring 27-year-old from Jakarta. In his video he shares footage and photos from the “Charify.FM 2015” event organized by him. He recounts how his initial idea to bring the online community together offline spiralled into an amazing fundraiser with more than 1000 people in attendance and $2500 raised. Runner-up, Genta Mansyur, has also been using his ASKfm platform to create change by providing counselling and resources for the lgbtqia+ community of Indonesia and far beyond. Prizes. 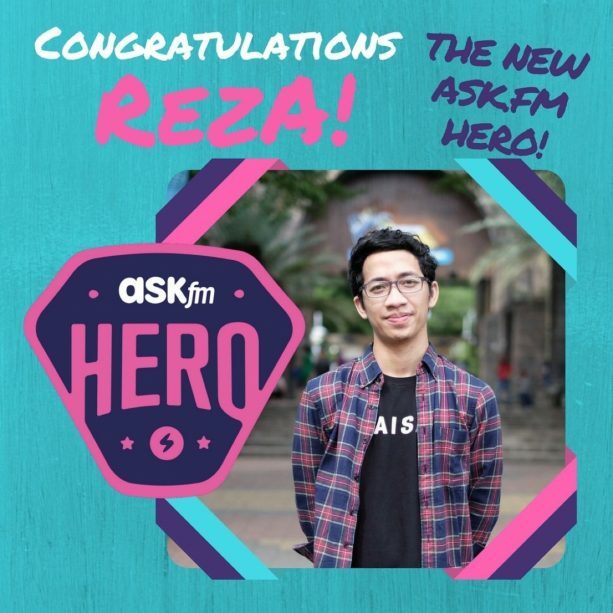 In addition to becoming the face of ASKfm, Reza has received $2,000 dollars for a dream event of his own choice, such as flight to his dream destination or Coachella music festival. Runner-up Genta has received a GoPro Hero 5 Black. Partnership. The competition was organized in partnership with The Diana Awards. It is a respected and trusted youth charity committed to empowering thousands of young people in the UK and Ireland to tackle issues affecting other young people by using a well-tested peer-led approach. The Diana Award has provided criteria for selecting the winner and set the panel of judges made up of Diana Award holders and other young social change-makers.